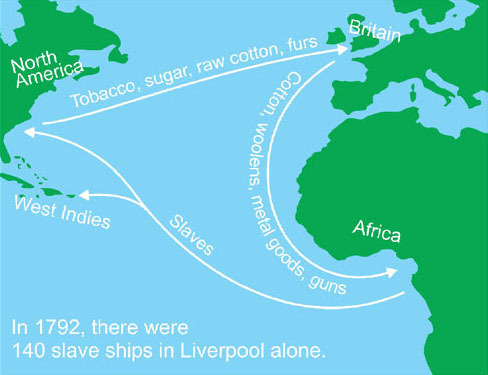 The “triangular trade” of the 18th century was a substantial component of the economy of Britain, its West Indian possessions and its American colonies, though it came at the horrible expense of enslaving untold numbers of Africans. As a former university professor, I’ve read thousands of students’ essays through the years — sometimes joyously, but just as often painfully. Occasionally, the process of researching and writing exerted a significant influence on a student’s future interests and behavior. But of all the student essays ever written, I doubt that any had as profound an effect on its author and on the world as one that was penned 220 years ago at the University of Cambridge. The university’s annual Latin essay contest was known throughout Britain, and the honor of winning it was highly prized. In 1785, the topic for the competition was prompted by a horrific human tragedy a few years before: Near the end of a long voyage from Britain to Africa to the West Indies, the captain of the British slave ship "Zong" had ordered his crew to throw 133 chained black Africans overboard to their deaths. He reckoned that by falsely claiming the ship had run out of fresh water, he could collect more for the "cargo" from the ship’s insurer than he could fetch at a slave auction in Jamaica. The original of this portrait of Thomas Clarkson by Carl Frederik von Breda hangs in the National Portrait Gallery in London. No one in the Zong affair was prosecuted for murder. A London court ruled the matter a mere civil dispute between an insurance firm and a client. As for the Africans, the judge declared their drowning was "just as if horses were killed," which, as horrendous as it sounds today, was a view not far removed from the conventional wisdom that prevailed worldwide in 1785. Indeed, perhaps the luckiest of the people taken captive and bound for a life at the end of a lash were those who succumbed aboard ship, where mortality rates sometimes ran as high as 50 percent. Surviving the "Middle Passage" across the Atlantic from Africa was only the start of a hellish experience — endless and often excruciating toil, with death at an early age. Moved by the fate of the Zong’s victims and the indifference of the court, the university vice chancellor in charge of selecting the topic for the 1785 contest at Cambridge chose this question: "Anne liceat invitos in servitutem dare?" — Is it lawful to make slaves of others against their will? Enter Thomas Clarkson, a man who, with a handful of compatriots armed only with words, would clutch the public by the neck and not let go until it consigned slavery to the moral ash heap of history. The poet Samuel Taylor Coleridge would later call him a "moral steam engine" and "the Giant with one idea." Clarkson, born in Wisbech in 1760, was a 25-year-old Cambridge student when he decided to try his luck in the essay contest. He hoped to be a minister, and slavery was not a topic that had previously interested him. Still, he plunged into his research with the vigor, meticulous care and mounting passion that would come to characterize nearly every day of his next 61 years. Drawing on the vivid testimony of those who had seen the unspeakable cruelty of the slave trade firsthand, Clarkson’s essay won first prize. What Clarkson had learned wrenched him to his very core. Shortly after claiming the prize, and while riding on horseback along a country road, his conscience gripped him. Slavery, he later wrote, "wholly engrossed" his thoughts. He could not complete the ride without frequent stops to dismount and walk, tortured by the awful visions of the traffic in human lives. At one point, falling to the ground in anguish, he determined that if what he had written in his essay were indeed true, it led to only one conclusion: "It was time some person should see these calamities to their end." 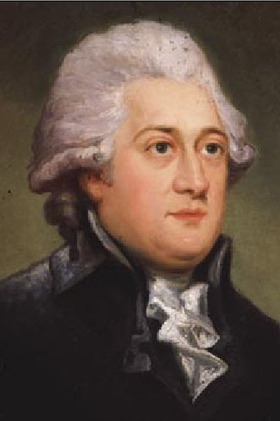 If there is a single moment at which the antislavery movement became inevitable, it was the day in 1785 when Thomas Clarkson sat down by the side of the road at Wades Mill. … For his Bible-conscious colleagues, it held echoes of Saul’s conversion on the road to Damascus. For us today, it is a landmark on the long, tortuous path to the modern conception of universal human rights. More than two centuries later, that very spot is marked by a monument, not far from London. At first, he sought out and befriended the one group — the Quakers — who had already embraced the issue. But the Quakers were few in number and were written off by British society as an odd fringe element. Quaker men even refused to remove their hats for any man, including the king, because they believed it offended an even higher authority. Clarkson knew that antislavery would have to become a mainstream, fashionable educational effort if it were to have any hope of success. On May 22, 1787, Clarkson brought together 12 men, including a few of the leading Quakers, at a London print shop to plot the course. Alexis de Tocqueville would later describe the results of that meeting as "extraordinary" and "absolutely without precedent" in the history of the world. This tiny group, which named itself the Society for the Abolition of the African Slave Trade, was about to take on a firmly established institution in which a great deal of money was made and on which considerable political power depended. "Looking back today," writes Hochschild, "what is more astonishing than the pervasiveness of slavery in the late 1700s is how swiftly it died. By the end of the following century, slavery was, at least on paper, outlawed almost everywhere." Thomas Clarkson was the prime architect of "the first, pioneering wave of that campaign" — the antislavery movement in Britain, which Hochschild properly describes as "one of the most ambitious and brilliantly organized citizens’ movements of all time." The credit for ending slavery in the British Empire is most often given to William Wilberforce. He was the longtime parliamentarian who never gave in to overwhelming odds, introducing bill after bill to abolish the trade in slaves, and later slavery itself. Wilberforce was a hero in his own right — but Thomas Clarkson was prominent among those who first proposed to Wilberforce that he be the movement’s man in Parliament. Moreover, it was the information Clarkson gathered crisscrossing the British countryside — logging 35,000 miles on horseback — that Wilberforce often used in parliamentary debate. Clarkson was the mobilizer, the energizer, the fact-finder and the very conscience of the movement. In "Thomas Clarkson: Friend of Slaves," biographer Earl Leslie Griggs writes that this man on fire was "second to no one in indefatigable energy and unremitting devotion to an ideal," and that, "He inspired in his friends confidence in his ability to lead them." But Clarkson did not relent. He, Wilberforce and the committee kept spreading the message and looking for the best opportunities to advance it. It was at Clarkson’s instigation that a diagram of a slave ship became a tool in the debate. Depicting hundreds of slaves crammed like sardines in horrible conditions, it proved to be pivotal in winning the public. Clarkson’s committee also enlisted the help of famed pottery maker Josiah Wedgwood in producing a famous medallion with the image of a kneeling, chained black man, uttering the words, "Am I not a man and a brother?" The effort finally paid off. The tide of public opinion swung firmly to the abolitionists. The trade in slaves was outlawed by act of Parliament when it approved one of Wilberforce’s bills in 1807, some 20 years after Clarkson formed his committee. Twenty-six more years of laborious effort by Clarkson, Wilberforce and others were required before Britain passed legislation in 1833 to free all slaves within its realm. The law took effect in 1834, 49 years after Clarkson’s epiphany on a country road. It became a model for peaceful emancipation everywhere. Wilberforce died shortly afterwards, but his friend devoted much of the next 13 years to the movement to end the scourge of slavery and improve the lot of former slaves worldwide. Clarkson died at the age of 86, in 1846. He had been the last living member of the committee he had gathered at the London print shop back in 1787. Hochschild tells us that the throngs of mourners "included many Quakers, and the men among them made an almost unprecedented departure from sacred custom" by removing their hats. In "Thomas Clarkson: A Biography," Ellen Gibson Wilson summed up her subject well when she wrote of this man from the little village of Wisbech, "Thomas Clarkson (1760-1846) was almost too good to be true — courageous, visionary, disciplined, self-sacrificing — a man who gave a long life almost entirely to the service of people he never met in lands he never saw." An essay by a university student struck a spark, which lit a beacon, which saved millions of lives and changed the world. 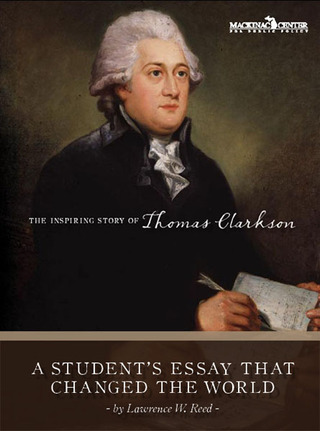 If you ever hear anyone dismiss the power of the pen, just tell them the story of Thomas Clarkson, his prize-winning essay and the astounding events they brought forth for humanity. Two years after the publication in 2005 of the first edition of this essay, a remarkable motion picture was released worldwide. 'Amazing Grace,' starring Ioan Gruffudd as William Wilberforce and Rufus Sewell as Thomas Clarkson, is a historically faithful, must-see movie for the entire family. Amazing grace, how sweet the sound, that saved a wretch like me; I once was lost, but now am found, was blind but now I see. What is less well-known is that Newton’s lyrics were autobiographical. He had been a slave ship captain given to incessant cursing and stonyhearted treatment of his captives, but had undergone a spiritual awakening and penned the song that moves congregations across the world to this day. Newton served the cause against slavery more immediately during this seminal period through an entreaty to William Wilberforce. Early in Wilberforce’s parliamentary career, before becoming involved in the antislavery effort, he had toyed with the notion of leaving government. John Newton convinced him to stay, advancing the view that God intended Wilberforce to fulfill a great purpose.